This Table is distinguished for its subtle proportions, the delicacy of its lines, and its superb carving and craftsmanship. The raised and openwork carving of the male, female, and baby dragons seen on the spandrels and ornamental side panels is of the highest quality and is rarely found on a Chinese table of this or any length, especially one with a long, solid plank of richly grained huanghuali wood that has retained a soft brown color and patina. 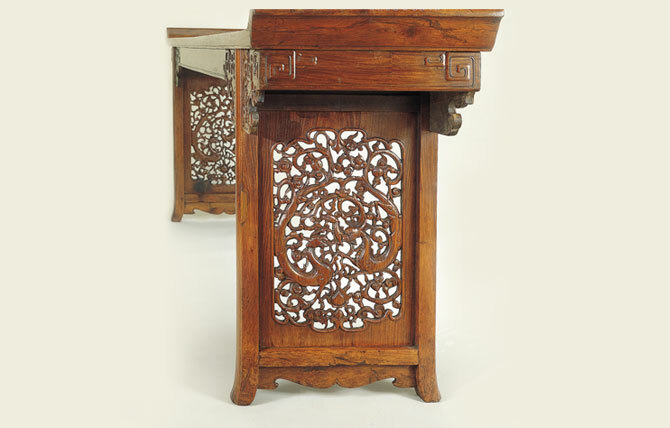 Originally in the holdings of Ming Furniture Ltd, this Table can now be found at The Metropolitan Museum of Art, New York.